This week, we’re continuing our efforts to put new skills into the game! This time we’ve been focusing on the one-handed weapon skills, and put together two entirely new ones for you to try out! The first one is a spell which summons shadow clones of yourself who will follow you around and deal damage to whatever you hit with your normal attacks. On level one you’ll get a single clone which deals 33% of your normal attack damage, and at level two you’ll gain another clone which deals 25% of your damage. The spell type works pretty much like the Cloud Strike spell for now: after you cast it once it reserves part of your mana pool and stays active until you cast it again. The second spell is an area of effect spell in which your character channel his or her inner power and deal damage to all enemies within a target circle. As you level this skill you’ll notice that the target circle becomes bigger and that you’ll be able to hit the enemies within it an additional number of times. Next up we hope to finally finish the dungeon, so get ready for some epic boss battle(s)! Another week has past by with some decent progress being made! Teddy has been away to act as yet another judge, this time for the Swedish Game Awards which we happened to win last year. Best of luck to all the participants! 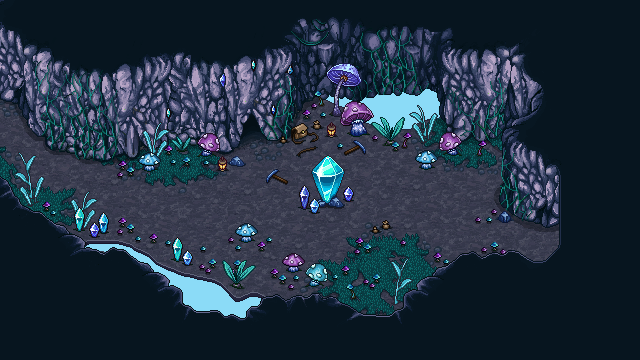 Vilya has been busy adding more touch ups to Mount Bloom. Below is a picture of an area that will hold one of the many side quests Mount Bloom has to offer. 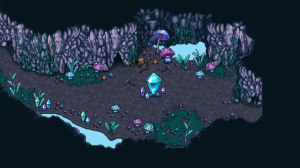 Crystal mining is risky business, even for seasoned Collectors! 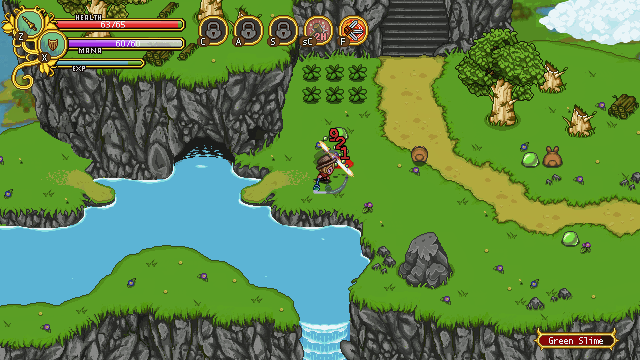 Fred has been working on animations for a couple of upcoming skills, mainly from the One Handed Weapons-tree. Below are some effects for one of the new skills, at the moment named “Shadow Clone“. We’ll hopefully be able to talk more in depth about them next week when they’ve been properly implemented into the game. As some of you noticed, last week there was no recap, due to us all being invited to serve as judges at Gotland Game Conference, an event held each year at our old university! We all had a blast, but we couldn’t work that much on the game and as such didn’t feel we had enough to show. A huge congratulations to the well-deserved winners of the “Pwnage Award”, the first year students who made CoBots! Now we’re back in the groove and working again, so here’s a taste of what we’re doing! 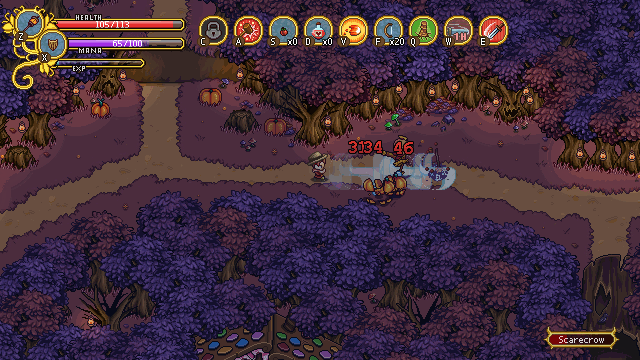 First off, since we’ve made a bunch new magic spells, we felt we needed to expand on the weapon skills as well. First in line is a two handed weapon skill which has been temporarily (and creatively) dubbed throw! As always, click the image for an animated gif! 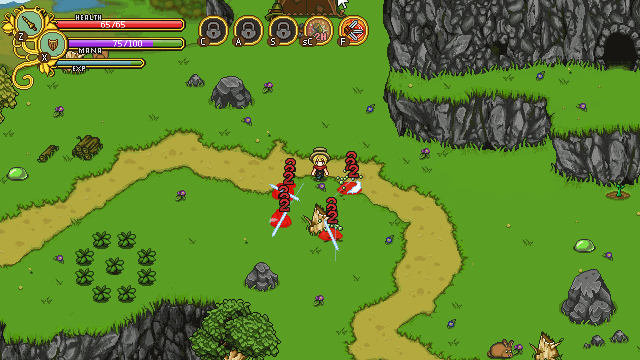 The reason for adding the throw skill was to add the potential of using ranged attacks with weapons. Currently it doesn’t have quite as long range as some of the spells, but it’s enough to open up some strategical options. The further you throw the weapon, the greater the damage will be when it hits. We’re toying with different ways to use the fact that you actually throw away your weapon! It’s a pretty powerful spell considering it slices through all enemies in its path, so we’re considering having a significant mana cost that can be partially refunded by picking up the weapon again, or maybe even disabling the weapon from being used again until some time has passed or the player collects the weapon! This could create some interesting gameplay, but at the same time we have to be careful not to cause unnecessary confusion or frustration. Expect this skill to have evolved quite a bit before final release! 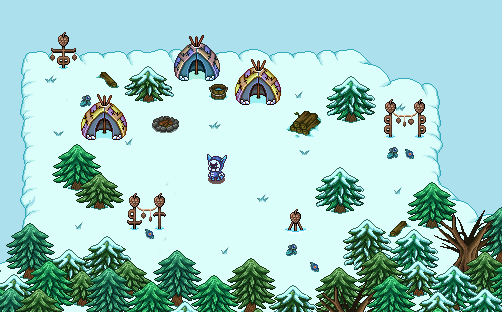 In the meantime, Vilya has revisited the Winterland area and added a bunch of new props and decorations! Here’s a shot of some tribal inspired environment made to match the Frostling enemy which Fred’s been animating over the past few weeks.